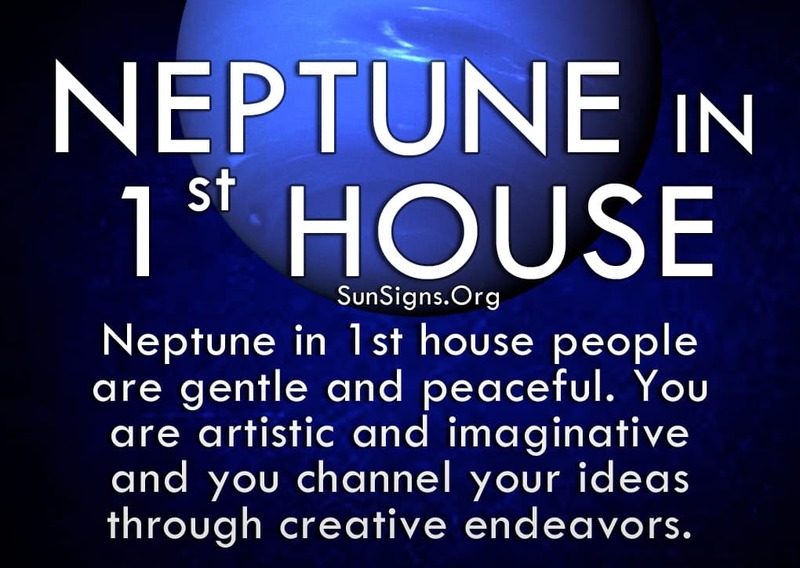 While the first house is usually strong and brazen, Neptune changes that description to gentle and peaceful. Rather than wanting to be first, you care more about what’s happening to those around you. Because of this, you alter your personality or mannerisms to fit whatever environment you’re hanging out in. Planet Neptune in astrology is all about intuition, selflessness and idealism. These are not traits often associated with the first house, but Neptune offers a calming effect on your normally fast-paced personalities. You are more artistic and imaginative and you channel your good ideas through creative endeavors. Because you are hyper aware of your surroundings you always know the best way to fit in and get along with people. With Neptune in the first house, your sensitivity and subtle charm draw people in. Everyone sees something different in you. This is why you often have a large social circle, for you get along with anyone. Because of this, you sometimes find yourself with many dating prospects or people fawning over you even when you’re with someone. It’s because you’re so accepting that people want to be with you. You have an understated allure about you that is hard to describe, but usually begins with your easygoing manner. Make sure to do some research on how to run things smoothly and efficiently before letting someone else take over your life. Either that, or stay focused on it yourself. If you can take responsibility for the end result, it will add to your confidence and the idea that you can accomplish anything. Find out more about your spiritual sign to know better. It can be difficult for your partner to get used to the unwanted attention that you get, so be aware of their feelings. People with Neptune in the 1st house are not overly flirtatious but people can get the wrong impression just the same. So make sure your partner knows where they stand with you. This can be difficult at times because you would rather go with the flow than stir up controversy or start an argument. But at the same time, your partner will grow tired of always bringing up the problems in your relationship. Learn to address any issues you have immediately so they don’t fester and become even bigger. You sometimes feel like nothing can be done, but that’s just a cop out. That thought process simply allows you to walk away from a situation so you don’t have to deal with it. But sometimes you have to face things head-on to get anywhere, and your partner deserves that much, if not more. Hiding from your problems is never a good solution. So use your intuition to guide you to the right answer. Your ability to observe everything going on around you will come in handy. The one thing that will help the Neptune in 1st house people in any case is your enjoyment of and enthusiasm for life. You dream big and you want others to join you in your grand schemes. This is what allows you to go far in life, your ability to come up with new and exciting ideas. The only trouble is your lack of follow-through. While you thrive on starting something new, you have trouble seeing it through to the end. You often rely on others to take your idea and run with it. This is fine so long as the people who take over are trustworthy. But if you choose the wrong individuals then your plan or project will fall flat. As Mars is your ruling planet and Aries is your ruling zodiac sign, you tend to be in a rush all the time.